In the lead up to last week’s referendum on whether the United Kingdom should remain in the European Union, immigration often seemed to be at the forefront at the debate. 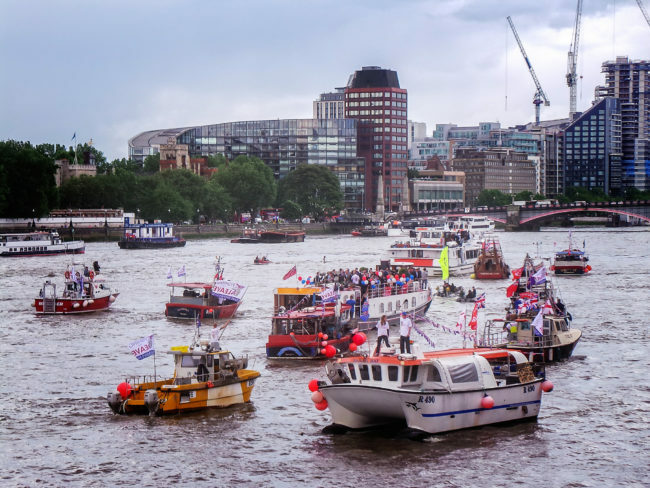 But the fishing industry was also a hot topic, even leading to demonstrations and bitter exchanges on the impact of EU membership, including from boats on the Thames. 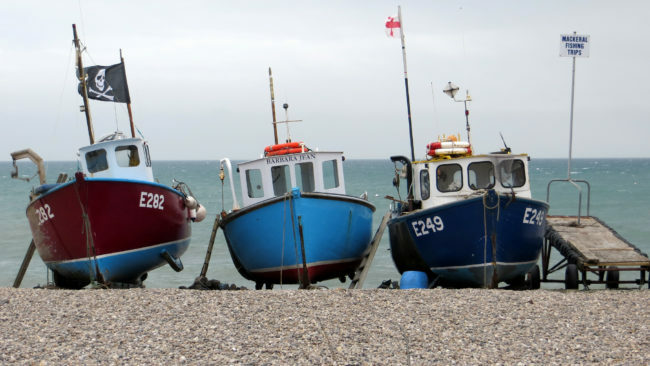 With the UK voting to leave the EU, there is a lot of uncertainty for the future of fisheries. Here are some areas, affecting policy, science and society, where the impacts may be felt. The Common Fisheries Policy (CFP) manages fishing fleets and stocks in the EU; it allows all Member States open access to EU waters. But the CFP has been criticized as being ineffective in managing fish stocks. The “leave” side had been campaigning against the CFP, so the assumption should be that the UK will push to free its fisheries from the CFP framework, possibly towards the model currently used by Iceland and Norway. Fisheries management and negotiations for fish quotas — Fishing quotas are used to attempt to prevent stocks from being overfished. Total allowable catches are shared between EU countries as quotas. These quotas are allocated to each member state, but this is negotiated, rather than equally divided. Currently, fishers from outside the UK can buy British vessels and fish under British quotas, while UK operators are entitled to do the same in other Member States. New rules must be applied if the UK leaves the CFP. The UK could potentially adopt a position similar to Norway and negotiate fishing quotas with EU countries, but this may result in a less beneficial share of the quotas. Restricted waters and the Exclusive Economic Zone (EEZ) — A nation’s Exclusive Economic Zone (EEZ) is an area extending up to 200 nautical miles from the coast where that country has the rights to the marine resources located there. Going forward, it is uncertain whether the UK will allow access by foreign fishing vessels to its EEZ. Currently, the principle of “open access” confers privileges on other EU vessels to fish in UK waters, an issue that proved controversial on the Brexit campaign trail. Following full withdrawal by the UK from the CFP, EU vessels will have to formally request access to the UK EEZ in the same way as any other state – full fisheries competences will be restored to the UK, and the coastal state has the exclusive choice as to which states will be given access to the surplus fish. The management of transboundary and highly migratory species will still have to be addressed in collaboration with other countries. If access is given, UK will have to work efficiently with EU to monitor and regulate the fisheries. Demonstrations during the Brexit campaign on the impacts of EU membership on the UK's fishing industry. Image: "BoatLeave - 03" by Garry Knight, CC0 1.0. Marine conservation— Marine conservation is an issue since the UK currently has a series of obligations under the EU Marine Strategy Framework Directive (MSFD) and the Habitats Directive, which each set the goals for biodiversity and habitat protection. For instance, Marine Protected Areas (MPAs) are a management tool for protecting marine ecosystems but criteria can be varied. If the UK is no longer under the MSFD, then they need to come up with their own strategy, hence the form of new MPAs or habitat protection would depend on the UK’s next government. Since 2009, the various devolved administrations of the UK have developed a series of MPAs under new coastal legislation, which may act as a guide to frame future policy in this regard. Discard ban– Discarding is when unwanted fish catch is thrown back into the sea, dead or alive, due to size, quota restrictions or other reasons. The recent reform of the CFP in 2014 includes a landing obligation for discards, meaning all fish caught must be brought to land, to reduce this wasteful practice. This important change was being put in place in the UK, beginning with pelagic stocks in 2015. The discard ban was then planned to be extended to cover all other stocks between 2016 and 2019. If the UK is no longer part of the CFP, the next government will have decide whether or not to keep this discard ban and its different modalities. Scotland independence– With the ‘Leave’ campaign winning the referendum, Scotland’s First Minister expressed the will to organize a new referendum on independence in order to stay in the EU. In fact, Scotland voted in great majority (62%) for remaining in the EU. If an independent Scotland were to join the EU, the principle of open access would apply to Scottish waters, but not those of the remainder of the UK. This potential situation might cause uncertainties and conflicts in fisheries management, especially as Scotland represents 64% of UK landings. Leaving the EU could affect many parts of the fishing industry, including how and where the boats fish. Image: "Fishing Boats" by xlibber, CC BY 2.0. Research funding — A significant proportion of current scientific and academic research conducted in the UK is funded by the EU; €120 billion of the 2014-20 budget was dedicated to research and innovation, and project partnerships across countries are necessary for some funding programmes. A report from Digital Science states that the UK could face a £1 billion annual funding loss for science research. Fisheries research is significant for the EU as a whole, even if individual Member States have a varying interest in this issue, given that a number are landlocked. Data sharing — Research data is currently shared between EU member states through the INSPIRE directive, which addresses the gathering of data by several institutions, or EU project partnerships. These data are needed for scientific research, and the scientific community has greatly benefited from progress made in data sharing. The UK will have to decide which policies to adopt in this area, and if it continues to participate in these different initiatives. 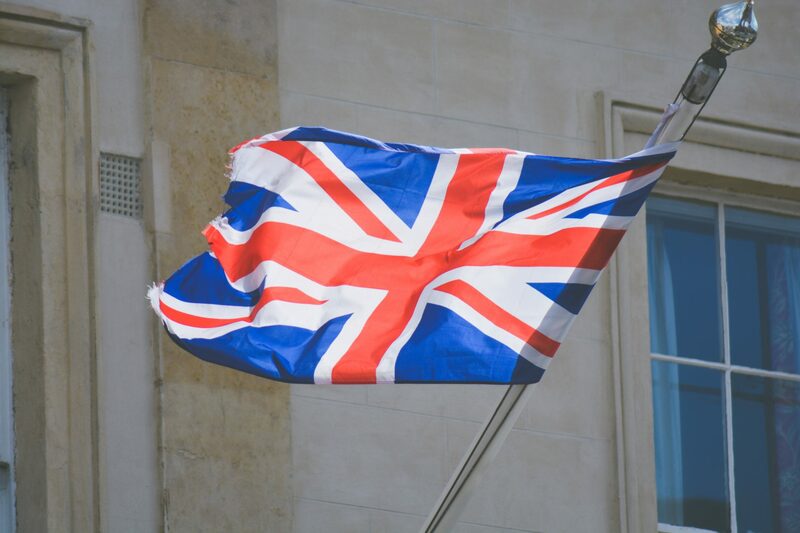 Human resources — Researchers and staff coming from other EU member states to work in the UK may face uncertainties if immigration laws change. Groups composed of researchers from different Member States working in tandem with UK specialists may have issues going forward or be cut off from funding. 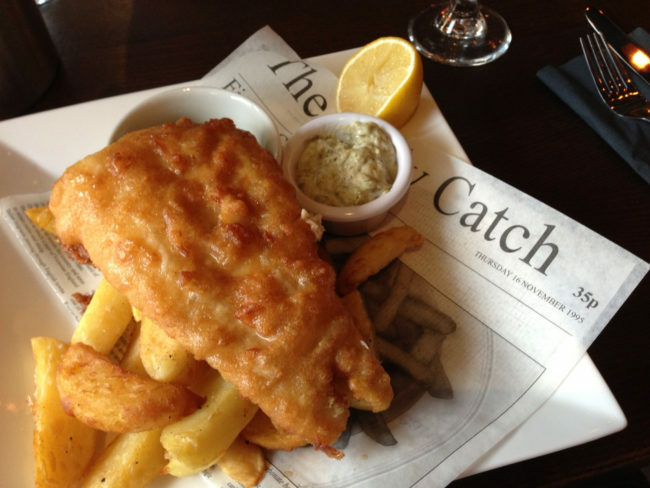 Due to Brexit, the UK's ubiquitous fish and chips may get more expensive. Image: "Fish and Chips" by Smabs Sputzer, CC BY 2.0. Seafood prices — Fish and seafood prices for consumers may change. The UK is a net importer of fish, meaning they import more than they export. In 2014, it was estimated that 721,000 tonnes of fish were imported into the country and 499,000 tonnes exported. This may be balanced to some extent by a greater access to national fish stocks by UK operators, but significant imports will still be required. Market access — If the UK goes for a full break from the EU, then trade with the EU will operate under the WTO rules and seafood would incur moderate tariffs. How does this affect the UK fisheries? Everything else being equal, then this just makes UK exports more expensive. However, we’ve already seen an approximate 10% decline in GBP which should make the UK exports more competitive, while reducing the purchasing power for imported goods. Fishers’ livelihoods — Many fishermen felt that the CFP was unfair and threatened their livelihoods. The Brexit campaign emphasized the numerous difficult impacts of EU policies on fisheries, notably the reduction in the number of fishermen and boats. Brexit emphasizes the need for the UK government to clearly detail its vision for the fishing sector, including for small-scale fisheries and the aquaculture industry, as well as ecosystem-based approaches to fisheries management.